In Windows operating system since Windows Vista, including Windows 7 / 8 / 8.1 / 10, Windows Server 2008 / R2, Windows Server 2012 / R2 and Windows Server 2015 / 2016, it’s very easy to change the size of the partition or resize partition by using Disk Management Console, which also provides ability to change drive letters or paths. Partitions with NTFS, FAT32 or FAT file system can be resized with the Disk Management utility. And unlike Windows XP or Windows 2000, there is no third-party application program such as Partition Magic needed. Disk Management Console can resize the partitions without any data loss or the need to delete and remove the existing partition and recreate the partition with new size. 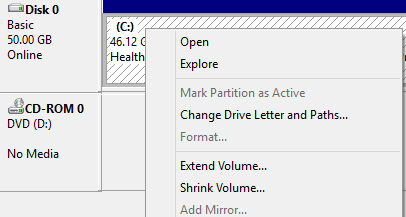 Right click on any volume or partition that needs to resize or change the size, and select either Expand or Extend Volume (to increase the size) or Shrink or Shrink Volume (to reduce the size) to change the size of the partition. You can only expand a partition if there is free unallocated space on the disk. Enter amount of space to expand or shrink in MB (cannot exceed the size of available expand or shrink space in MB). 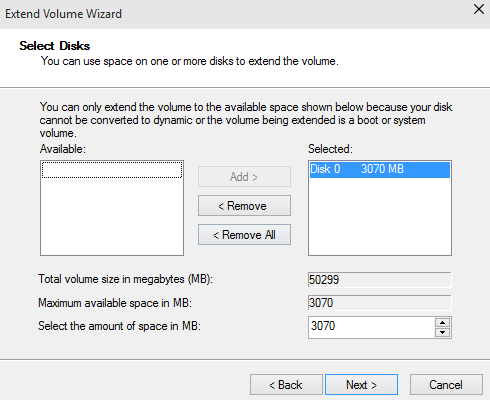 In newer version of Windows, a wizard is used when extending the size of partition to handle both simple and spanned volume. The concept is the same, so just follow the instruction wizard to complete the procedure. Click on Expand or Shrink button when done. Windows will reduce or extend the size of the partition online immediately, without the risk of data loss.